No modern self-driving car can do without them. This system works like this: cameras receive a picture and the algorithms processes and analyzes it. Modern systems are quite good at analyzing road signs and markings. Also, they are capable of classifying objects into the categories “adult – child – dog – cyclist – passenger car – truck”. The advantages of using cameras are that they are affordable and can fix transverse movement quite well (for example, the car systems can identify a person crossing the road with ease). The downsides of using cameras are their lack of accuracy when measuring distances to objects around them as well as their movement speed. Besides that, they can’t always distinguish objects in poor visibility and are sometimes triggered with a noticeable delay. Cameras in a self-driving car are the cheapest and the most reliable way of obtaining information about the surrounding objects. However, due to the flaws in the image recognition system, it is far from perfect. Radars use radio waves to accurately determine the distance to nearby obstacles and their speed. The main advantages of radars are that they can detect obstacles in any weather and visibility conditions, as well as accurately detect objects’ speed and distances from them. However, installing a radar can be quite expensive. Not only that, radars cannot classify objects, and their range of measurement depends on the viewing angles. At the moment, radars, as well as cameras, are used on almost all self-driving cars. However, we cannot say the same about our next type of sensor. Lidars are capable of measuring distances to objects with high accuracy, by directing laser beams around itself. It processes data and presents it as an array of points. Lidars, unlike radars, can define the shape and dimensions of the object with precision. The downside of using lidars is that they can only look at the same section of the road once every 2-3 seconds. In addition, they are expensive, so the Tesla company decided against using them at all. This is a very specialized technical solution, and it is not suitable for mass production of autonomous cars. These sensors are used in almost all models of self-driving cars. The problem with them is that they can only see surrounding objects at a short distance and cannot determine the speed and exact location of the object. For this reason, ultrasound sensors cannot provide sufficiently reliable information on their own, but they are affordable and work quickly. Some autonomous cars are equipped with infrared cameras that can see animals and people in any weather conditions and time of day. However, this solution is even more expensive than installing lidars, while at the same time having a rather narrow scope of application. The people who develop self-driven cars do not have a single answer to the question of which of these devices are needed, and which ones they can do without. 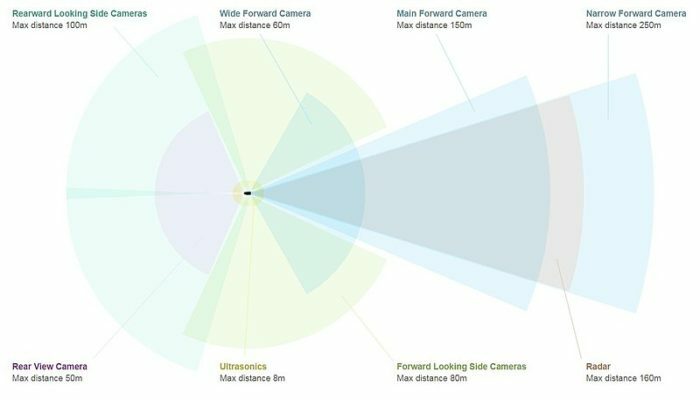 Tesla is focused on mass production of cars, so it uses reliable and affordable cameras and radars in their vehicles. Elon Musk believes that if a person drives a car using only two eyes, the robot can do the same. Cameras in Tesla cars provide a full 360-degree view. Two cameras are hidden in the central pillars, two more are behind the arches of the front wheels, one is behind the license plate, and three are under the windshield and in front of the rear-view mirror. 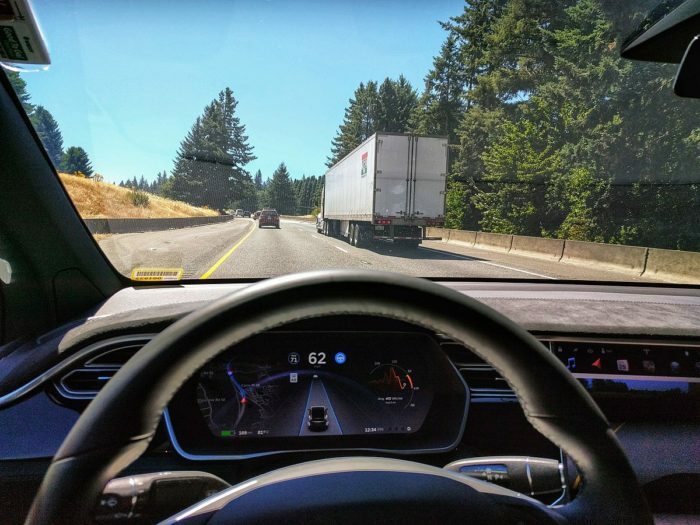 Other self-driving car companies use lidars and other devices to make the autopilot safer because the machine vision doesn’t work that well as of now. The cars with the lidars and other expensive devices are not available for mass use at the moment. And this is at odds with the ethical, social and, most importantly, with the economic aspects of using self-driving cars. Even the thousand or so cars sold can’t cover the costs needed to develop the autopilot. The next article will be devoted to the safety and social aspects of the development of self-driving cars.